Major League Baseball’s coldest hitter ever is now on a hot streak. Just a few days after picking up his first few hits of the season, Baltimore Orioles slugger Chris Davis belted his first home run of 2019. Davis’ dinger came in the eighth inning of Monday’s game against the Boston Red Sox. With one out and a runner on second, Davis took a 3-2 pitch from Heath Hembree out to right field for a two-run shot. 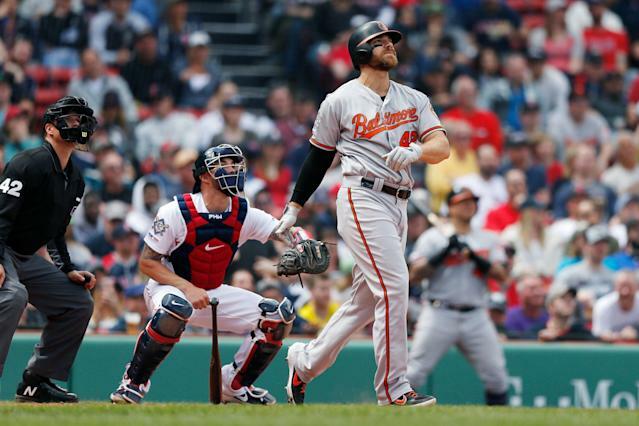 The hit extended the Orioles’ lead to 6-1 over the Red Sox. Baltimore went on to win the contest 8-1. For Davis, it was the slugger’s first home run since Aug. 24. Davis hit that home run off his former teammate Zack Britton. It’s been a trying season for the 33-year-old Davis. He broke the record for the longest hitless streak in baseball in early April. It took Davis until Saturday to break out of that slump, which lasted 54 at-bats. During Saturday’s game against the Red Sox, Davis picked up three hits, including a single and two doubles. Davis drove in four runs, and was instrumental in Baltimore’s 9-5 win. Given how poorly Davis started the season, his recent stretch can be considered a hot streak. In three games, Davis raised his average from .000 to .089. It’s not much, but it’s a start. Where does Davis go from here? The Orioles may have won Monday’s game, but no one expects the team to be good in 2019. Because of that, there’s no downside to the team putting Davis in the lineup every day and seeing if he can post respectable numbers again. The days of Davis receiving MVP votes are over, but he still walks and can provide pop. If nothing else, he gives casual fans a reason to care about the Orioles, and that’s not an easy task.